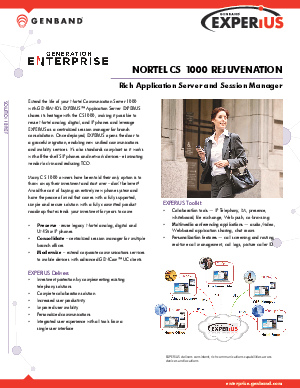 Extend the life of your Nortel Communication Server 1000 with GENBAND’s EXPERiUS™ Application Server. EXPERiUS shares its heritage with the CS1000, making it possible to reuse Nortel analog, digital, and IP phones and leverage EXPERiUS as a centralized session manager for branch consolidation. Once deployed, EXPERiUS opens the door to a graceful migration, enabling new unified communications and mobility services. It’s also standards compliant so it works with off-the-shelf SIP phones and network devices– eliminating vendor lock-in and reducing TCO.